Annual stock market returns are about 10% lower during the three to five years after construction of a record-breaking skyscraper begins than during other years. The predictive ability of such construction starts is statistically significant and stable over time. Completion of record-breaking skyscrapers does not predict stock market returns. New tallest-building starts outperform prevailing historical mean return, dividend-price ratio, dividend yield, 10-year price-earnings ratio and a combination forecast as stock market return predictors. A strategy that goes to stocks (cash) at the end of years when there is not (is) a record-breaking skyscraper construction start over the prior four years during 1915-2009 generates an annual Sharpe ratio of 0.47, compared to 0.35 for buying and holding stocks. Results are consistent for 1915-1945 and 1945-2009 subperiods, but stronger during the latter. Record-breaking skyscraper construction starts predicts international stock market returns, but evidence is weaker than in the U.S.
Construction financing conditions do not influence record-breaking skyscraper construction. 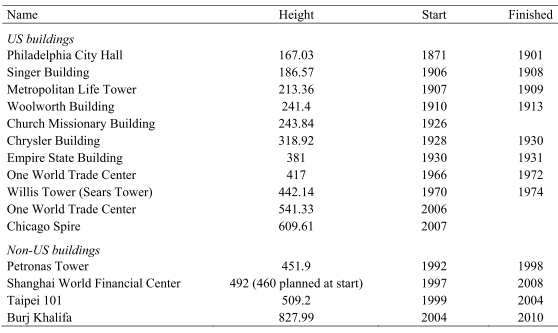 The following table, taken from the paper, lists construction dates for towers that were expected to break the U.S. or world record at the time when construction began. Heights are from the building’s base to its highest architectural element. In summary, evidence from a small sample suggests that starts of record-breaking skyscrapers indicate stock market weakness over the next few years. Statistical significance testing assume a tame stock market return distribution. To the extent the actual distribution is wild, the power of this testing diminishes. While mitigated by robustness tests, direct and borrowed data snooping bias in modeling and parameter selection still appear possible. Such bias is pronounced for small samples.